This is a simple and uncomplicated Vashikaran Mantra Chant for lay-persons to calm down all unfriendly people, including rivals, enemies, secret enemies, relatives and other other cruel persons who are spoiling your peace of mind or whom you consider as a constant threat to your welfare. If you feel that your mental peace or existence is under threat from more than one person or if you suspect that you have secret enemies and rivals whose names and identities are not known to you, then, you can try chanting this simple Shatru Vashikaran Mantra Chant as the procedure is so simple that any person can easily practice this Dushman or Gupt Shatru Nivaran Mantra Prayog without experiencing even the slightest difficulty or inconvenience. 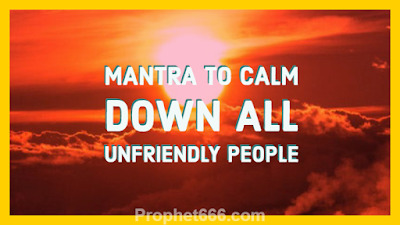 The Mantra, which is given below has to be mentally chanted 21 times in order to calm down all unfriendly persons even if theirs names and identities are unknown to you. There is no need to take the names of the enemy or enemies before chanting this Vashikaran Mantra. The practitioner can chant this simple Vashikaran Mantra daily or for as many days as he wishes or until he feels that he has got the desired results. The Vashikaran Mantra can also be effectively utilized to remove problems in the job created by unknown rivals or the boss or to calm down unfriendly people in your social circle or relative, like your Mother-in-Law, Father-in-Law, Brother-In-Law, Sister-in-Law or any other family members who are constant creating problems for you and have spoilt your mental peace. Notes- This post has been written keeping in mind the needs of lay-persons so that they can get simple and easy cost-free Mantra Remedies and Solutions which are uncomplicated and do not take much time or effort. Many such practical and useful Vashikaran and Enemy Related Mantras can be seen in the sections on Attraction Mantras and Mantras for Enemy Problems. Neeli thanku so much for giving this mantra. I think everyone should chant . I am very grateful to you for this mantra. Im impressed.